Moshe Safdie, this stunning structure incorporates a triangular-shaped main building, an adjacent rectangular administration building, a glass-enclosed Urban Room, and a public piazza. The site also features a rooftop garden, amphitheater, a children’s garden, and a variety of local shops and services. An iconic feature of the design is the sloping wall that originates at the site’s northwest corner and descends to mid-block point. The wall defines both the Urban Room and the piazza, and provides a connection to the existing library. 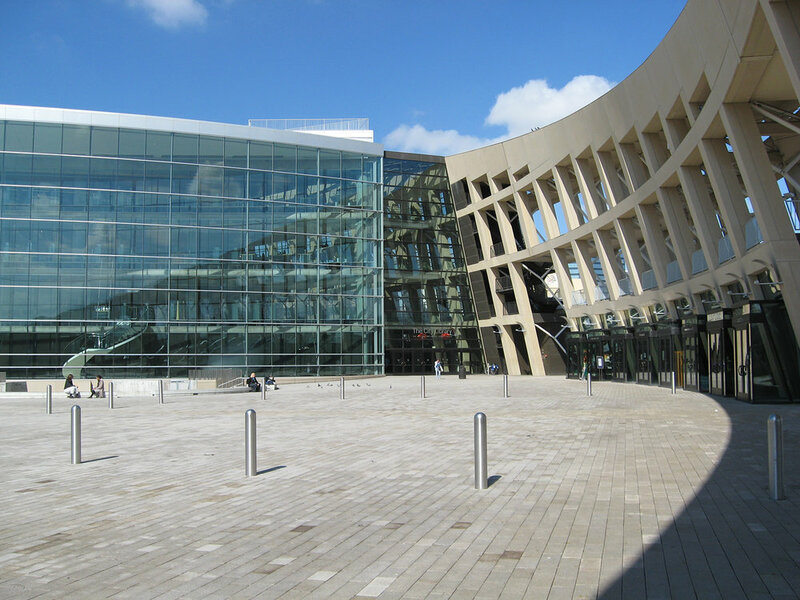 Multi-level reading areas along the transparent southern facade of the building provide dramatic views of the city and mountains, and overlook the piazza. At night, the glass facade shimmers in a crescent-shaped reflecting pool.